To achieve a particular rank advancement in Boy Scouts a scout is required to earn a set amount of money, determined by the scout and his parents, and save at least half of it. This is pretty tough for the kids to do; they're young, can't drive, have little money to invest in anything, and aren't old enough to enter the work force. Ian accomplished this requirement by selling a kayak he had. Adam and Kaden have some some stuff from my dad that they are welcome to sell, but they haven't really found their motivation yet - they just aren't sure that this is the way they want to earn the money. We also received a free Teacher's Guide and a link to an inspiring, informational video on YouTube. Carol Topp is a CPA who specializes in micro/small businesses and has worked with other teens, including her own daughters, as they started and ran their small businesses. And just what is a micro-business? It's basically a "super-small" business with one employee, quick start-up, low start-up costs, sole proprietorship, low risk, and generally run as a home based business. A micro business allows time for other activities and an opportunity to learn while earning cash. The boys began by watching the YouTube video, Micro Business for Teens: Starting a Micro Business. They learned of other kids who started their own businesses and succeeded. One teen was offered a crazy amount of money to sell his business and he refused, thinking he'd like to keep running it himself and he could get more money that that for it(!). Adam and Kaden were both motivated after watching the video, for us it was a perfect beginning to the program. They then read Starting a Micro Business and Running a Micro Business and worked through the workbook. In Starting a Micro Business, the boys began by learning about overhead, start up costs, and risk. Then they brainstormed, coming up with as many ideas for businesses as they could (River's idea was to teach people how to make lemonade -- after I taught him how, of course). They learned the hows and whys of writing a business plan and why you should avoid debt when opening a business. Here's where we had a nice talk about my businesses. I think knowing someone who runs a micro business made what they were learning more "real" to them. They asked a lot of great questions and we had a great time reminiscing about my store and discussing Because I'm Me, which they see "in action" every day. First I had Ditto Kiddo, my children's new and resale shop. The shop was open for 9 years and was successful, closing so I could spend more time with my family - which turned out to be very well timed as the economy tanked, I found out I was pregnant, and I became a single parent all within a few months of the store closing. I majored in Business in college so I had a good idea of what I was getting myself into. I knew not to expect a profit for two years, I knew what I needed to get a loan, and I knew the importance of defining my store and writing a business plan. Only I was in a hurry to get the store open, so I bypassed the business plan and loan and financed the start-up costs using credit cards (I feel sick just saying that, having now not had or used a credit card for over five years). I was lucky in that the store was successful and did turn a profit before too long, much less than two years, but still, that's not the way to do it and I'd never, ever do it that way again. My current business, Because I'm Me, didn't face issues with start up costs, I started by selling quilts, handbags, and baby items, and parlayed that profit into tie making. So, start up for Because I'm Me was much simpler. Of course, there are still things to know when running a business, like taxes and marketing (which is ever changing in this digital age). Which brings us to Running a Micro Business. To me, running a business and succeeding is way harder than starting a business. Half of new businesses fail within the first five years, many, especially in our very seasonal part of the country, don't plan ahead and fail midway through their first summer (my former husband and I understood season, having been in the restaurant business, we made sure to save enough money to cover June-September completely by May). Running a Micro Business covers taxes, marketing, customer service, insurance, and all those other legal details that we don't necessarily know ahead of time, and don't want to find out about when it's too late. Adam, in particular, really liked these books and devoured the information in them. When I asked him for his thoughts on the program one of the first things he pointed out was that he now knew more than a lot of adults about running a small business. He's right. He found the information interesting and very empowering - and motivating. The books are easy to read and follow, they're written for teens so while they're chock full of information it's presented in a down to earth manner. Adam hasn't started his own business yet, but he's excited to do so. Finding the right business isn't easy, even with him writing down 10+ different business ideas he's not sure he's found his niche. Right now he's looking at car washing and/or doing weeding for neighbors. My thoughts on this program ... I think it's pretty great. The information is invaluable, and would be a solid resource for any teen (or college student) looking to start their own small business. As I've mentioned a few times before I'm not a fan of downloadable books for schoolwork (or anything! ), so I'm considering investing in the hardcover versions of these for Ian and Mia to read and for all the kids to have as references. If just one of them started a business and used the information in the books it'd be well worth the price of the materials. 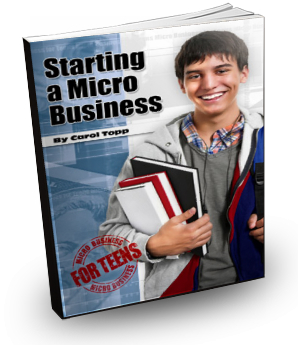 Starting a Micro Business for Teens is available for $4.95 as a PDF file, or in a softcover print book for $9.95. Running a Micro Business for Teens is also available for $4.95 PDF and $9.95 softcover. Micro Business for Teens Workbook is available for $9.95 PDF and $14.95 softcover. The books are geared towards kids ages 10-18. Last night the kids and I volunteered at a Duck Dynasty/Salvation Army world record breaking duck call event. While there, Willy Robertson talked about his start in business, how someone had given his family a bunch of gum that he turned around and sold on the school bus and at school until the principal told him he had to stop. Still looking to earn money he became a "human jukebox", kids on the bus would slip him a quarter and he'd sing part of a song for them. Cool micro business. Jody, Thank you for the review! I really appreciate it. You're kids are fortunate to see your business in action and can learn from your mistakes. I love that Adam is smarter than many adults about business! Just think of what he'll know in 10 more years! I'm glad you liked the video (It's on YouTube here http://youtu.be/K2g_MKqLUpo). The young man your mentioned, Phil , is now a college graduate and is in California working for Google!